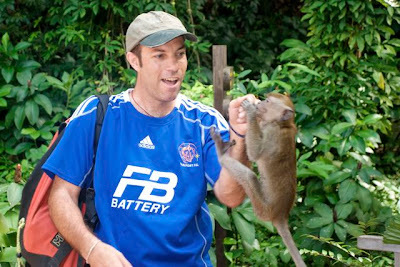 Having recently written a somewhat cautionary post about venturing near monkeys, I figured I'd share some of the benefits of walking, armed only with a camera, among our hirsute cousins. 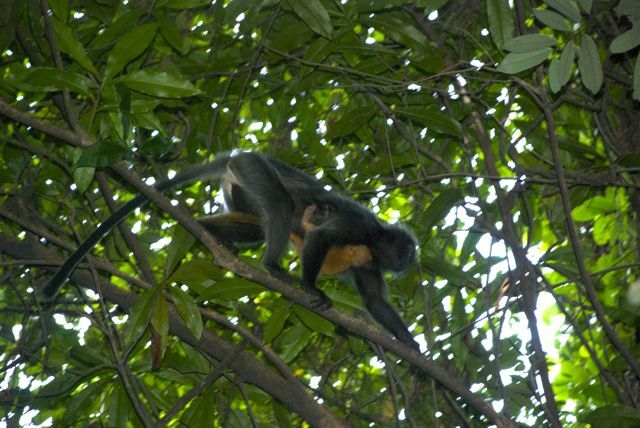 My favorite monkey encounter occurred in Bukit Nanas Forest Reserve, a small rainforest park in the middle of Kuala Lumpur. Located only 2 blocks from a Starbucks, the park is a refreshing taste of green shrouded wilderness in the middle of a bustling city. On my first visit, I stopped by the welcome center to get information. The ranger asked if I had seen the monkey outside. "Monkey, what monkey?" "Nora. She's spends a lot of time near the center." I walked out back toward the trails and sure enough there was a young monkey. She nimbly jumped into the arms of one of the staff, who promptly handed Nora to me. I was a little taken aback, but hey, when someone hands you a monkey, you take the monkey. It's the only polite thing to do. Nora swung from my hand for a bit, then hopped over to a tree. Later she surprised me by diving right onto my shoulder before balancing on the back of my outstretched hand for a spell. I was thrilled; just remembering the experience makes me break out in a smile. I almost extended my stay in Kuala Lumpur just to have more opportunities to interact with her. I have no idea if Nora is still around now, a couple of years later, or if perhaps she began spending time with the other monkeys that live in that small park. Mother and child roam the forest. 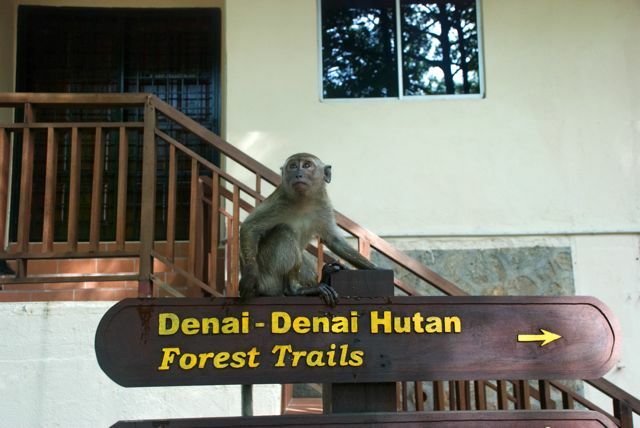 For more photos of Kuala Lumpur's forest and other sights, please click here.